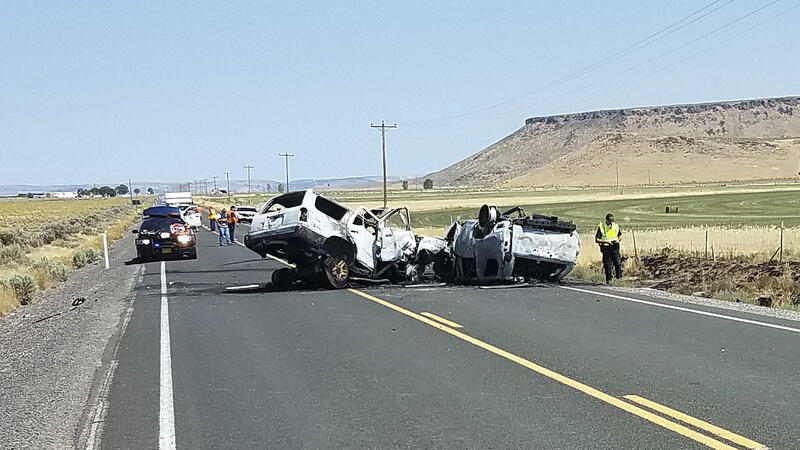 The scene of a fatal car crash outside Burns, Ore., earlier this month. 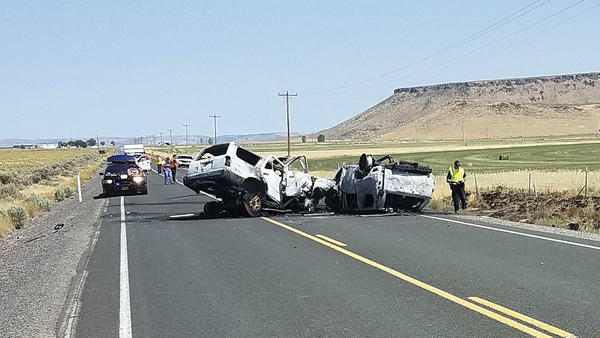 Based on state-reported statistics, the National Safety Council says approximately 18,720 people died on U.S. roadways between January and June of this year. That's a less than 0.5 percent dip from 18,770 deaths recorded in the first six months of last year. From 2014 to 2016, the number of people killed in motor vehicle collisions jumped from a little over 35,000 to more than 40,000, before leveling off at about 40,000 fatalities last year, a trend that appears to be continuing. "We are seeing a plateauing of the number of deaths in the first six months of 2018 compared to 2017," said Ken Kolosh, the lead researcher for the National Safety Council. "So in some sense we are treading water right now," he said, "and treading water is better than drowning, but it is not as good as moving forward and getting better." The surge in highway deaths coincided with a growing economy and cheaper gas prices, which combined to lead to a sharp increase in vehicle miles traveled, which Kolosh calls "a perfect storm" to increase motor vehicle fatalities. While the economy continues to grow, the number of vehicle miles traveled so far this year is not increasing at the rate of those 2014-2016 levels. Current levels are still lower than the early 2000s. Kolosh says speeding, drug and alcohol impaired driving, distracted driving and failure to wear seat belts all continue to contribute to motor vehicle fatalities even as vehicles and roadways become safer. "Cars are getting safer," said Kolosh, referring to rear-view cameras, lane departure warnings and other safety features that are becoming standard on many new vehicles. "But not everyone trades in their car to get the latest safety technology," he said, "so safety improvements vehiclewise take many, many years, if not a decade, to trickle into the system." One improvement appears to be in the area of distracted driving, as Kolosh says there is some evidence drivers may be texting less behind the wheel and doing fewer other tasks on their smartphones while driving. The National Highway Traffic Safety Administration conducts observation studies every year, looking at what drivers are doing behind the wheel. "And they're actually seeing decreases in the number of drivers interacting with their cellphones while behind the wheel," says Kolosh, adding that tougher laws banning texting and talking on hand-held devices appear to be working.